This animalistic painting was executed by very good listed German animalist painter Carl Friedrich Deiker (1836 Wetzlar - 1892 Duesseldorf). He came from the family of famous landscape and animalistic painters: he was a son of German animalistic painter Friedrich Deiker, younger brother of Johannes Christian Friedrich D., father of Hans D. First study by the father in Wetzlar, then to the Drawing Akademy Hanau, since 1858 at the art school in karlsruhe under j.W.Schirmer, here his first monumental hunting painting (Estate of Great Herzog of Baden), in 1850 travelled for study to Reinhardswald, from where came two large boar hunt scenes , one of them was purchased by Great Prince Mihail of Russia, and the second - by Margrave Max of Baden. In 1861 he moved inKarlruhe in own studio. In 1864 he moved to Duesseldorf, where he worked 4 years with his older brother Johannes Christian D. His hunt scenes are more dramatic and less still in contrast to animal works of his brother Johann Christian Deiker. 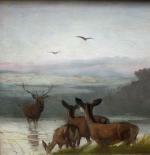 In Duesseldorf, he immediately attracted a lot of attention with his 1868 issued painting: "Victims of Red Deer", which came into possession of the Grand Duke of Odenburg. D.broken first a really big train in the art animal paintings by based upon an old Dutch tradition, mainly to Snyder´s model. Unlike his brother, the animal usually represented in a state of rest, he loved the strong movements , described in a masterly way the desperate struggle of the game.. His favorite animals were Wildssau, the deer and the dog. Since 1870, he fired academic prestigious exhibitions in Berlin and Dresden, the international art exhibitions in Munich and the exhibitions in Dusseldorf and Hannover. He also worked as an illustrator for famous magazines. Works: Wallraf-Richartz-Museum in Cologne; City painting gallery in Dueseldorf; Hamburg Kunsthalle; Karlsruhe Kunsthalle. In 1892 - personallity memory exhibition in Duesseldorf. Literature: "General Artist´s Lexicon " by Thieme/Becker, Leipzig, 1999. Inscription: signed lower right; original bronze plaque with the artist‘s name mounted to the frame; on the back of the painting is old label with the artist‘s dates. Technique: oil on wood. Original period gilt frame. Measurements: unframed w 17 1/2" x h 6 7/8" (44,5 x 17,5 cm), framed w 23 1/3" x h 12 3/4" (59,5 x 32,5 cm).